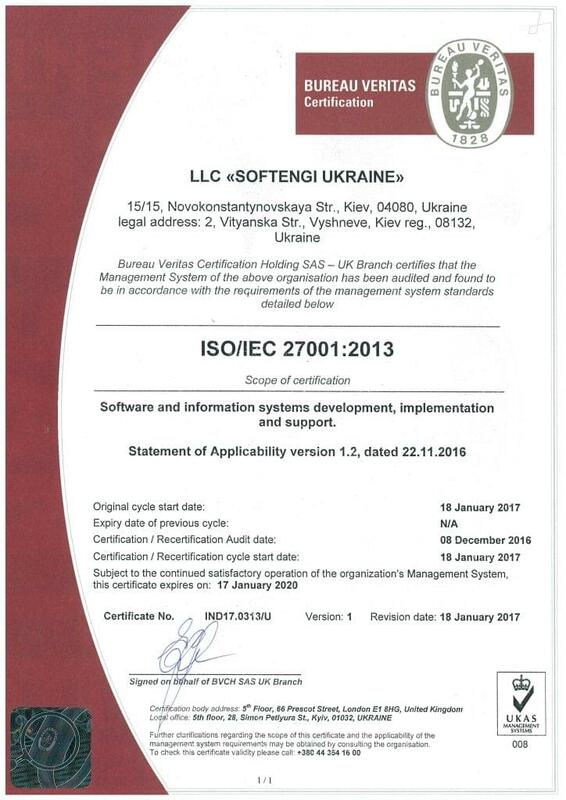 Softengi, a global software engineering services provider, is pleased to announce that it has recently been awarded an ISO/IEC 27001:2013 certificate for information security management. By achieving this internationally recognized and prestigious certification, the company has demonstrated its commitment to information security standards and continuous improvement in software and information system development, implementation and support. Gaining this certification was a direct response to company’s customers’ and partners’ concerns about the safety of their personal, sensitive, and confidential information. The ISO/IEC 27001:2013 certificate verifies that Softengi has established and implemented best-practice information security processes and has all the necessary infrastructure to handle information and equipment assets with the highest degree of security. This certification also proves that the company is serious about cybersecurity and has implemented appropriate practices to mitigate cyber risks. Softengi is a global SOFTware ENGIneering services provider. The company’s mission is to help companies overcome their business challenges using information technologies and lead them into the Digital Era. With a vast pool of professionals working in nine offices worldwide, Softengi applies an individual approach to create top-notch software solutions for your business. Listed three times in the Global Outsourcing 100® compiled by the International Association of Outsourcing Professionals (IAOP®), Softengi is officially recognized for its excellence in global performance. Learn more at www.softengi.com.